With its release of “Mikasa,” VoM has shown that it has adopted not just clean vocals, but clean vocal melodies that sound as though they were lifted from Top 20 tunes. Do I only have bad things to say about the new material? No. The mix is great. VoM’s mixes used to be incredibly lo-fi, so it is great to hear this top-notch production work. Moreover, I also actually find the new vocalist’s screams to be quite good. The variety of different styles, from lows to highs, is nice to hear. That said, there sure is a lot to critique. First and foremost, let me make myself clear: I have no problem with clean vocals. Obviously. I use them in probably 1/3rd of my music. What I do have a problem is with inane diatonic pop music. Metal that uses clean vocals does not by any means need to be inane diatonic pop music; the categories are not mutually exclusive. VoM, however, has quickly crossed into this category. There is literally nothing musically separating the clean vocal sections from 0:29-0:44, 1:26-2:00, and 2:23-3:03 (i.e., close to half of the entire song) from Top 20 pop music. Musically, I can transcribe it, replace it with a less aggressive singing style, electronic drums, and synths instead of guitars, and it would be virtually identical to something you would hear on the radio. Listeners may not notice, but, when one does more than just superficially hear music, one quickly grasps that literally the only thing that makes sections like these—the obligatory refrains in most songs from metalcore bands—different from Top 20 pop music is texture—the use of certain instruments, not the music itself. The other parts of “Mikasa” are bearable, but there is nothing progressive about them. Before djent sold out, the determining attribute of the style was, in spite of the insistence of some to the contrary, not a low-sustain onomatopoeic 7- or 8-string guitar tone, but rather the superimposition of irregular time signatures over common time (4/4). Djent used to be about doing this, but has now just become a pop metalcore spinoff that happens to use a modicum of syncopation. The only part of the song that is in any way musically innovative is the metric modulation at 0:45-1:00. This brief 15-second riff arguably constitutes the only progressive moment in the entire song. Djent was already in its death throes. Periphery II was its jumping the shark moment. 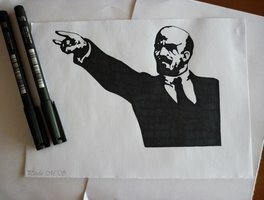 Before Russian revolutionary Lenin died, he had three strokes. In the path toward its demise, djent had three strokes as well. In May 1922, Lenin suffered from his first stroke. In May 2013, TesseracT released Altered State, 50:41 with very little chromaticism, no screamed vocals, and as much consonance as you would hear in the average electro-pop track. Just a few months later, in December of the same year, Lenin survived another stroke—albeit partially paralyzed. When VoM released its first track with its new lineup, “Phoenix,” and the vocalist used the phrases “I’ve held it in my hands” eight times and “Evil lingers within everything” seven times, djent suffered its second stroke. The next year, in May, Lenin endured his third and final stroke, yet not without great cost—it left him bed-ridden and mute until his death in January 1924. Periphery’s abysmal Juggernaut: Alpha and Juggernaut: Omega represent this bed-ridden and mute stage of djent. The fact that the former album appeared at No. 15 and the latter at No. 16 on the Billboard Top 200 charts serves as a testament to this fact. Djent has literally become Top 20 music—and it had to compromise its technicality, progressiveness, and uniqueness in the process. With VoM’s adoption not just of clean vocals, but of Top 20-style clean vocals, the heartbeat of djent has officially flatlined. Veil may have risen, but Veil of Maya has died. And it has taken djent down with it.